Patrick Kelly of Rockport (right) sizes up Rafael Velado during their New England Fights amateur lightweight title fight on June 17 in Lewiston. The 52-year-old Kelly beat Velado to claim the belt. The Maine Amateur Wrestling Alliance Hall of Famer and longtime wrestling coach at Camden Hills Regional High School in Rockport had won all four of his previous amateur bouts since first taking up the sport in 2013 — an unbeaten streak that included winning the New England Fights amateur lightweight championship belt. But in his title defense against Massachusetts native Ed Forlenza as the main event in the amateur portion of “NEF 35: Wicked Season,” Kelly’s streak finally came to an end. Forlenza, a 32-year-old Cape Cod product armed with a wrestling background of his own, scored a takedown in the opening minutes of the bout and used ground-and-pound to stay on top and win by technical knockout at 2:42 of the first round of their scheduled five-round bout. “I met my match,” said Kelly, the Young’s MMA product who had announced in the weeks leading up to this bout that it would be his final MMA match, win or lose. “I felt I had more. He did catch me with a really good stiff shot, and then when he took me down I thought, ‘This guy knows what he’s doing and I just have to weather the storm because I’ve got five rounds.’ But I let him get on top and I didn’t scramble enough and it just wasn’t my night. Forlenza improved his record to 3-2. Kelly, also a schoolteacher and a father of four, was disappointed with the loss but put his MMA journey in perspective during a postfight interview in the cage in front of the 1,200 assembled fans. And while Kelly says he’s done as a mixed martial arts fighter, he’s not done exploring life. The Kelly-Forlenza bout was one of seven amateur contests on the 12-fight card. 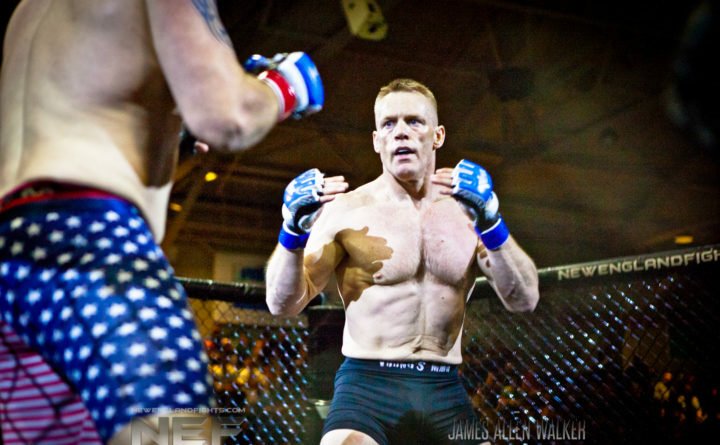 In the opening amateur match, Andrew Brown of Nostos MMA in Somersworth, New Hampshire — cornered by Nostos’ owner and UFC fighter Devin Powell of Wells — used an armbar to gain a submission victory over independent Chris Lachick at 2:55 of the first round of their fight, contested at a catchweight of 160 pounds. Powell’s fighters went 2-0 on the night, with Nostos’ Zac Richard stopping independent Cliff Redman via first-round TKO in their lightweight contest. Bucksport’s Shawn Costigan, part of the coaching staff for the Bucksport High School wrestling team, used his fists rather than his grappling skills to make a successful debut. He required just 52 seconds to score a TKO victory over independent featherweight David Hills, using three straight right-hand strikes to send his opponent to the mat — with the stoppage coming seconds later. Another independent, Jordan Young, had more success, defeating Joe Howard of Central Maine Brazilian Jiu-Jitsu of Lewiston with a rear-naked choke at 1:50 of the second round of their featherweight clash. Another amateur winner was welterweight Christian Barrett of First Class MMA in Brunswick, while Jacob Deppmeyer of First Class MMA and Taylor Bartlett of CMBJJ fought to a draw at a catchweight of 150 pounds.